A collection of vintage postcards designed when women were admitted to the Paris bar in 1900. Beautiful images, interesting commentary on women’s prescribed gender roles, especially as rhetoricians and public speakers. I present below a complex, mysterious, and fascinating set of 15 French postcards published in 1900. It is a series on the theme of the woman lawyer published by a printer called Royer in Nancy, with the photos and design by a Nantes photographer, Morinet. [Apparently, the printer Royer still exists.] As can be seen from the translations below, the cards gradually lay out what is on its face a strong feminist manifesto, advocating for women to be accepted as lawyers, as well as for equality for women more broadly. 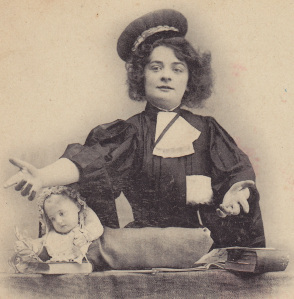 Notably, the series was published in a historical context in which there were many sexist caricatures of women lawyers, due to the passage of a law on December 1, 1900 authorizing women to join the Paris bar.